Disillusioned by corporate radio, Tyler Russell founded KX 93.5, Laguna Beach’s only FM station, in 2012. Noncommercial and community supported, it broadcasts into areas that were previously radio dead zones. 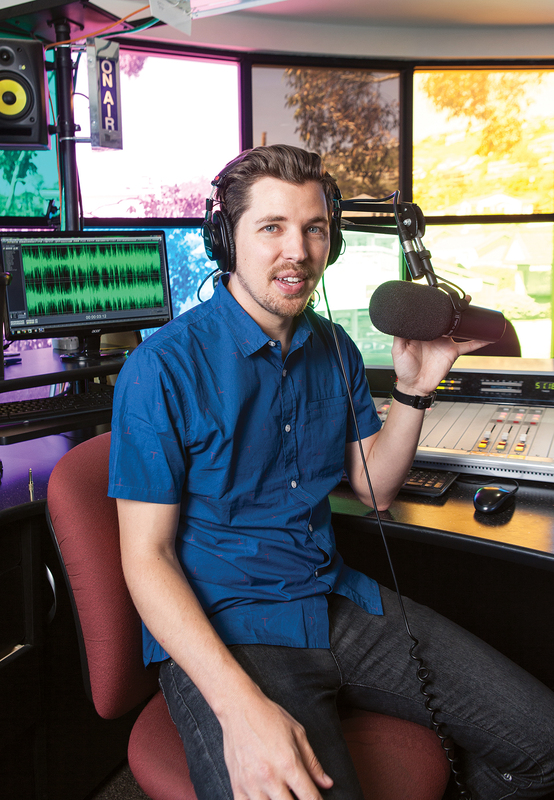 The station recently expanded its reach when KOCI-FM in Newport Beach began airing the flagship morning show hosted by Russell, 28, and musician Jason Feddy. TR: There are a couple of volunteers who have turned the station into something special. One is Greg Friedman, who hosts a show called “Inner Journey” on Sunday nights. He’s a modern-day shaman. He leads people on excursions to exotic places to help them discover themselves. He started this little advice show, which has more than 40,000 likes on Facebook, and he gets callers from all over the world. TR: My co-host Jason Feddy is the real star. He’s British, kind of a loved local treasure. He does a segment every Friday called “Jason Sings the Police Blotter” inspired by a minor crime that happened in town. It’s a riot. It’s definitely the most popular thing we do. TR: During the day, when Jason and I and our afternoon guy Zach (Churchill) are on the air, it’s mostly alternative and indie rock. But at night and on weekends, when it switches to volunteers, we’ve got rock, jazz, ska, reggae, folk. So it goes all over the map. TR: If you have no background, if you feel unqualified, if you don’t know how to host—that’s fine. All I care about is, do you have a passion for independent radio, do you get what we’re doing, and is the show that you’re proposing for the benefit of yourself or for the benefit of the community? And if the answer is the community, then you get why we’re doing this.